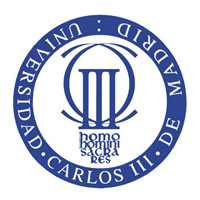 A Universidade Carlos III de Madrid foi fundada em 1989. É uma das seis universidades públicas da Comunidade de Madrid, em/na Espanha. Possui três campi: em Getafe, em Leganés e em Colmenarejo. Machining-induced damage is commonly observed when manufacturing components based on carbon fiber reinforced polymer (CFRP) composites. Despite the importance of thermal effects in machining CFRPs, this problem has been poorly analyzed in the literature. Predictive tools are not available for thermal phenomena involved during cutting, while only few experimental studies have been found. In this paper, a three-dimensional (3D) finite element model of orthogonal machining of CFRPs including thermal effects is presented. Predicted thermal and mechanical intralaminar damage showed strong influence of fiber orientation. Thermally affected area was larger than mechanically damaged zone. This fact confirms the importance of accounting for thermal effects when modelling CFRP machining. ; The authors acknowledge the financial support for the work to the Ministry of Economy and Competitiveness of Spain under the projects DPI2011-25999 and DPI2010-15123. We propose a new class of dynamic patent count panel data models that is based on dynamic conditional score (DCS) models. We estimate multiplicative and additive DCS models, MDCS and ADCS respectively, with quasi-ARMA (QARMA) dynamics, and compare them with the finite distributed lag, exponential feedback and linear feedback models. We use a large panel of 4,476 United States (US) firms for period 1979 to 2000. Related to the statistical inference, we discuss the advantages and disadvantages of alternative estimation methods: maximum likelihood estimator (MLE), pooled negative binomial quasi-MLE (QMLE) and generalized method of moments (GMM). For the count panel data models of this paper, the strict exogeneity of explanatory variables assumption of MLE fails and GMM is not feasible. However, interesting results are obtained for pooled negative binomial QMLE. The empirical evidence shows that the new class of MDCS models with QARMA dynamics outperforms all other models considered. Bueno, M. I.; Martínez Dopico, Froilan C.; Furtado, S.; Rychnovsky, M.
En este proyecto se ha creado un sistema de microblogging altamente interactivo mediante la tecnología Ajax. Los usuarios se validan sobre un directorio para acceder a la aplicación y una vez dentro, pueden escribir y leer mensajes cortos, enviar y recibir mensajes privados e interactuar con otros usuarios. Estas operaciones pueden realizarse de dos formas, individualmente, donde cada usuario sigue a las personas que desee y en asignaturas, que contienen a los usuarios matriculados. Estos grupos son proporcionados por el sistema automáticamente creando un grupo por cada asignatura matriculada, de esta forma se puede utilizar la aplicación como recurso docente. Terán Vergara, Fernando de; Martínez Dopico, Froilan C.; Pérez, J. This work introduces a new perturbation bound for the L factor of the LDU factorization of (row) diagonally dominant matrices computed via the column diagonal dominance pivoting strategy. This strategy yields L and U factors which are always well-conditioned and, so, the LDU factorization is guaranteed to be a rank-revealing decomposition. The new bound together with those for the D and U factors in [F. M. Dopico and P. Koev, Numer. Math., 119 (2011), pp. 337– 371] establish that if diagonally dominant matrices are parameterized via their diagonally dominant parts and off-diagonal entries, then tiny relative componentwise perturbations of these parameters produce tiny relative normwise variations of L and U and tiny relative entrywise variations of D when column diagonal dominance pivoting is used. These results will allow us to prove in a follow-up work that such perturbations also lead to strong perturbation bounds for many other problems involving diagonally dominant matrices. ; Research supported in part by Ministerio de Economía y Competitividad of Spain under grant MTM2012-32542. Castro González, Nieves; Ceballos Cañón, Johan Armando; Martínez Dopico, Froilán C.; Molera, Juan M.